We knew well in advance of going into Fallen Empire that our old stable of companions would get shaken up in this expansion... but I suspect that many of us still feel somewhat uncomfortable to be approaching the last chapter and think of all the companions that still haven't come back, especially since many of them are potential love interests and may be our character's husband or wife. About a year ago, I wrote a post called Companions I Wouldn't Want to Lose, in which I picked a favourite for each class that I wouldn't want to be without. Seven of those eight are still missing. 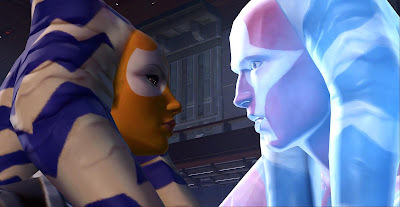 I'm sure I'm not the only one hesitant to take certain characters into KotFE because we currently don't know when they'll ever see their companions again, if at all. I wanted to look at how badly different classes have been affected by this and consider their chances of still getting their missing companions back later. For being pretty much the game's "poster child", the knight hasn't fared well at all in KotFE in terms of relationships with their old companions. 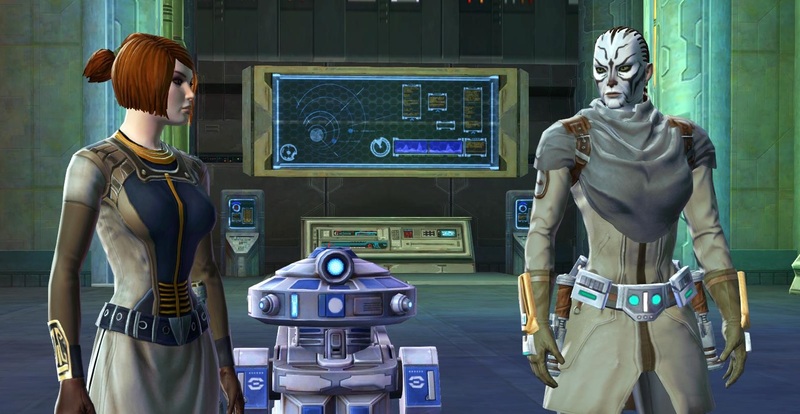 The only one that has returned to date is T7-O1, and while he does so fairly early on in the story, his role is very minor and there seems to be little of the boundless enthusiasm left that used to define the little droid's personality in the base game. Kira Carsen: Even though she is a love interest, which automatically complicates matters, I'm actually kind of surprised that Kira hasn't come back for KotFE. Considering her past, I would have expected her to be all over fighting the Emperor again, like flies on toast. Maybe she is afraid of him? The love letter she writes to a knight who romanced her states that she has nightmares of the knight falling under the Emperor's spell (again). She might even fear for herself, considering her past. Or maybe she's just too caught up with what's happening in the Republic right now. Either way I wouldn't expect her eventual reintroduction to pose any major problems. Doc: Like Kira, I would have thought of Doc as someone easy to introduce into the current storyline, seeing how he is basically a good guy who tends to get involved wherever his skills are needed. Just have someone get injured on the front lines and bam! Doc to the rescue. Sergeant Rusk: I would expect Rusk to still be busy fighting loyally for the Republic. I read that dataminers have spotted an Alliance alert for him lurking in the game files, but at this point I'm not sure we can expect any more of these to go live after 4.7 and before KotET. Lord Scourge: Now this guy's reintroduction is a pretty big issue. He really should have had a presence in Shadow of Revan already, considering his close involvement with the Emperor (seriously, just read the Revan novel). The fact that he hasn't commented on any of the events since then has put him into an awkward hole that is going to be difficult to crawl out of. It doesn't help that Bioware doesn't appear to have been able to get his original voice actor back, considering that his voice lines for his new combat roles added in 4.0 are voiced by somebody else who sounds jarringly different. For this reason, Lord Scourge is one of the companions about whose return I'm somewhat doubtful. I wouldn't put it beyond Bioware to just cut their losses with him and pretend to forget that he ever existed. You wouldn't have thought it possible, but the Jedi consular is even worse off than the knight, with only a single consular companion having returned in KotFE so far (Qyzen) and he's not even part of the main story, just an Alliance alert. I suppose we can take some comfort in at least an ally of the Barsen'thor returning in a later chapter, but it's not quite the same. Tharan Cedrax: Again, another companion that has me somewhat surprised that he hasn't returned yet, at least as an Alliance alert. As a quirky genius he would be a perfect addition to Doctor Oggurobb's team of scientists. Lieutenant Iresso: I don't see any major obstacles to Iresso making a comeback, but like other characters already mentioned, he's probably been busy serving the Republic and doesn't necessarily have an easy way of operating independently like Havoc Squad did. Nadia Grell: Nadia may have remained staunchly loyal to the Republic and the Jedi order or may have redirected some of her efforts towards her old home world, but either way she's always struck me as more of a defensive character, so I'm actually not surprised that she isn't out there fighting Zakuul already. I don't think it would be difficult to reintroduce her if the Outlander made closer contact with the Republic though. The trooper has probably been the luckiest of all classes (go me), as they got all but one of their companions back, and two of them even featured in the main story. The only one missing is Elara Dorne. If you talk to Aric as a trooper in chapter eleven, he mentions that Elara got in trouble after your disappearance.. presumably still something to do with her being a former Imperial? That would be a bit disappointing considering that this issue appeared to be done and dusted by the end of her companion story, but it's not completely unreasonable. This puts a bit of a question mark on where she might be and what she might be up to at this point in time, but at the same time that just means that Bioware has options to get creative. The smuggler hasn't had too much luck with their companions. Bowdaar came back in an Alliance alert, but not until several months after KotFE's release, and it looks like we should finally get Guss in 4.7. It's telling that both of their stories were delayed repeatedly though! Corso Riggs: Based on his previous antics, Corso could pretty much be anywhere, doing anything (as long as it doesn't involve being mean to women). That should make it easy to reintroduce him. On the other hand, let's be honest.... he's a bit of a shmuck! It would take some skill to come up with a reason why any non-smuggler would want to recruit him in particular. Risha: I think reintroducing Risha could be a bit tricky because of the whole thing with Dubrillion (trying to remain vague here). Of course Bioware could always ignore it and say that she's just continued working as a freelancer for the past five years, but to be honest I'd find it a bit disappointing to learn that she hasn't made any progress whatsoever towards reclaiming her heritage during that time. Akaavi Spar: While Akaavi is very much of a loner, it still feels like a bit of a missed opportunity that she wasn't brought back in some way related to chapter fourteen, which was about Mandalorians after all. While she's a skilled fighter, she's not someone to get caught up in fighting for a cause not directly related to matters of personal honour, and I think bringing her back would require the writers to come up with something new for her to actually care about. All in all, the Republic got the short end of the stick here, as twelve out of the original set of twenty companions remain missing (I'm already counting Guss as returned here). In comparison, the Empire is only missing nine, and no Imperial class is as badly off as the two Jedi classes who've seen neither hide nor hair of four of their five old companions. The Sith warrior is one of the luckier classes and had three of their five companions restored, one of whom featured in the main story arc. The only ones still missing are two love interests. Malavai Quinn: I think reintroducing Quinn shouldn't be too difficult in terms of story, as any contact with the Empire would probably work, but I suppose the story could be tricky to write in such a way that it pleases both the people who hate him with a passion and probably want to off him the moment he shows his face and those who actually forgave him or simply don't know him at all. 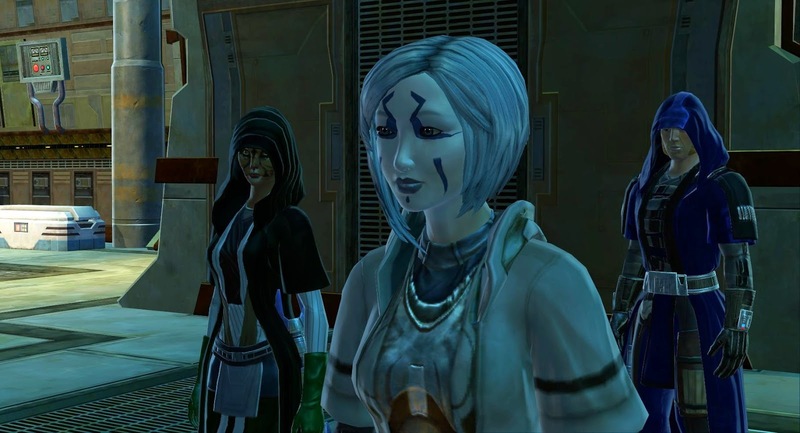 Jaesa Willsaam: Jaesa is probably one of the two most difficult companions to reintroduce and I'm not sure Bioware will be up to the challenge. Since she has a separate light and dark side version, she is basically a different person depending on your Sith warrior's choices, which would require two potentially very different recruitment quests... and then you'd still be stuck with the question of which version is "canon" and should be presented to non-warriors. I suspect that even if Bioware is up to tackling this problem, it would still have to be relegated to a side mission/Alliance alert, as I can see no way that two different Jaesas could be part of the main storyline. Which is a pity, because I'd love to see her use her special talents on Valkorion! Khem Val: Khem Val is the one character I would classify as Jaesa's equal in term's of difficulties with reintroducing him, because he too effectively ends up being two completely different people depending on your choices at the end of his companion arc. I'm a bit concerned that Bioware may have given up on dealing with this issue already, which would explain why they gave us an Alliance alert for a "replacement Dashade". I hope I'm wrong about that though, because nothing can replace good old Khem. Andronikos Revel: Similar to several of the smuggler companions, Andronikos is enough of a free spirit that he could be doing pretty much anything, but one has to wonder what would motivate him to fight against the Eternal Empire and what would make the Alliance interested in him. Ashara Zavros: The letter Ashara sends to an inquisitor who romanced her at the end of KotFE chapter one is full of despair. She feels that she's neither Jedi nor Sith and doesn't belong anywhere while everything is crumbling around her. I would have expected her to run off into Wild Space or something, but I'm open to Bioware coming up with some kind of plot to bring her back. The Imperial agent is probably the luckiest of the Imperial classes, because like the warrior they already had three companions returned, and two of them featured in the main storyline. However, like the warrior, two of the agent's love interests remain missing. Vector Hyllus: I think that the ease or difficulty of reintroducing Vector would depend on what he's gotten up to since the Eternal Empire took over. If he's still loyal to the Sith Empire, he can probably make an appearance related to that. If he's hanging out with the Space Killiks, it might be a bit hard to get him to care, unless they feature as an independent faction somehow and he serves as their ambassador. Raina Temple: Temple has a similar "problem" in that she could have cut herself loose from the collapsing Empire and might be seeing herself as more of a free agent than as someone loyal to anything or anyone. That's not exactly a major obstacle though. Oh wait, the bounty hunter also had three companions returned already, with two of them featuring in the main story. Did I mention yet how favoured the Imperial classes appear to have been in this? Mako: Of course the one major bounty hunter companion we're still missing is Mako, your very first friend. KotFE has given some conflicting info in regards to what she has been up to. Her letter to a romanced bounty hunter is full of despair and talks about how she's giving up on bounty hunting because all it's ever done for her is get people dear to her killed. However, in my bounty hunter's story, where Mako and Torian had been a couple, he said that he and Mako continued to hunt together after your disappearance and that he only left her because of Mandalore's summons, noting that she is quite capable of taking care of herself. I'd be happy to see the story continue in either direction... plus there is also the possibility that Mako found out more about her biological "family" in the past five years. There are definitely lots of opportunities to tie her into the main story line in an interesting way here. Skadge: Apparently this is another companion that has an unfinished Alliance alert lurking in the game files. Like with Quinn, I'm curious how Bioware will reconcile potential re-recruitment with the many bounty hunter players who will simply want to shoot him on sight. Looking at everything I've just written, I think the best way to reintroduce a lot of these missing companions would be to revisit the Republic and Empire in the next season... yes, I'm totally biased because that's what I want to happen, but you also have to admit that all of these loyal Jedi and dedicated soldiers might be hard to integrate if you completely disregard their loyalties and background. 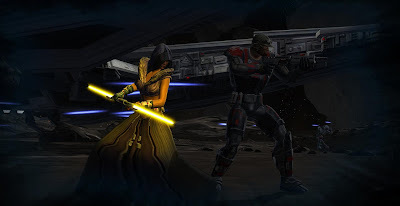 Whilst this will likely never happen, I would love for Scourge, Jaesa, and Khem to remain Class-Specific. It would negate the issues for Jaesa and Khem, and make Scourge's significant prophecy hold true. Additionally, Khem's body is of course actually bound (yay, I figured out how to italicise text in comments! =D) to the Inquisitor, meaning that he's very much a "triple-threat" to being introduced to another character since that's yet another thing to work around. I'd love to go to the Republic and Empire to track down our missing companions. Like you, I don't think it's very likely to happen in KOTET, but who knows, maybe after that, when Zakuul has been dealt with? You will be forced to save either Vette or Torian, I would recommend to sacrifice Torian because he is a mandolorian, and he was born to die fighting.